Chinatown chefs rock out with their knives out. I have a hard time trusting people who don’t really like to eat. There’s something primal and familiar about gathering together over a shared meal with friends. After all, we’ve been coming together over the fire-pit / grill / dining table / street-vendor stand with friends and family since we first crawled out of the cave. Yet, there are those among us content with lonely drive-thru dinners or defrosted versions of something archaic pulled out of the freezer, those who view food as mere fuel. Cringe. For me, food is so much more than fuel. It binds us together, strengthens our connections, and opens us up to one another. Over a delicious meal, anything is possible. You think Thomas Jefferson—an ardent cheese connoisseur—could have whipped out the Declaration of Independence without a Muenster cheese and Virginia ham biscuit sandwich in his colonial paw? For generations, well before brunch was cool, the likes of the noodle house Wo Fat and a staple of other old-school and delectable haunts served as the gathering spot for the people of Honolulu. Today, Chinatown continues to be home to an array of heralded Chinese culinary institutions like Legend Seafood, Mei Sum Dim Sum, and Char Hung Sut. It is on their shoulders that today’s culinary renaissance has taken shape. 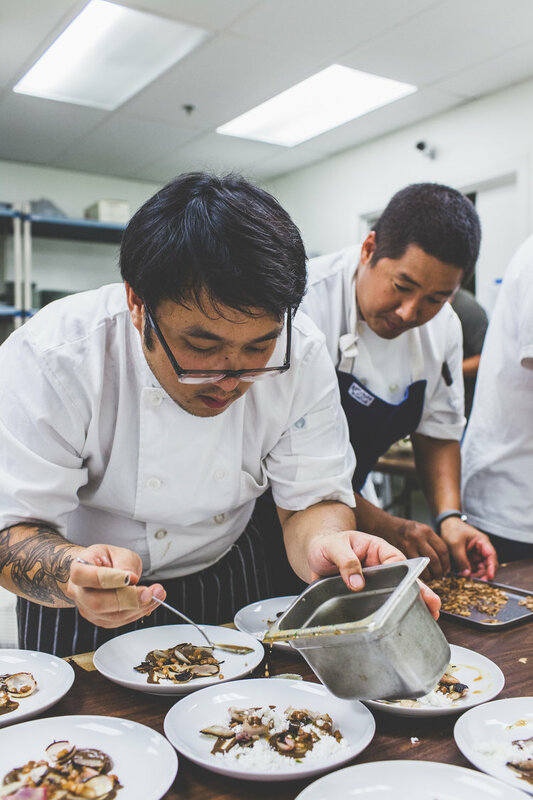 Since Chinatown’s past was forged on cuisine and bringing people together, it’s only fitting that food would prove to be the catalyst in our beloved Chinatown that is undergoing a revolution of its own, with a battalion of young chefs leading the charge. Over the past couple of years, a new restaurant has seemed to spring forth from the brick and mortar of Honolulu’s oldest streets almost every month. In spaces that were either neglected, abandoned, or once homes to decidedly shady businesses, the city has been gifted with the likes of Livestock Tavern, Lucky Belly, and The Pig and The Lady. Each of these restaurants has brought leagues of hungry patrons back to Chinatown. And they’re but a few of the new kitchens in town—throw in the likes of Grondin French-Latin Kitchen, Fête, Yakitori Hachibei, Brick Fire Tavern, Encore Saloon, the Tchin Tchin! Bar, Rain, Smith and Kings, Scratch Kitchen and Bake Shop, Bethel Union, Downbeat Diner, and the much-anticipated Senia, and you’re staring at some of the best and most progressive establishments in the state. Not to mention classic mainstays like Murphy’s, JJ Dolan’s, Restaurant Epic, and Little Village. And they’re all located within a city block or few of each other! To be sure, there are many, many more mouth-watering restaurants than those I’ve listed, but I’m short on my word count and trying not to ramble. So forgive me, and for the love of all things holy, please continue to feed me if I’ve left you out. So what does this mean for the neighborhood? Aside from my growing waistline, it means that we’re witnessing a transformation of the city right before our very eyes. When tourists venture out of Waikīkī and Ala Moana and into Chinatown—a place that many a guidebook mistakenly tells them to avoid—they’re often charmed by what they find. The hundred-year-old brick buildings, the boutiques, galleries, cafés, bars, and of course the world-class restaurants, sing to them. Many had no idea our neighborhood even existed, much less that it was so authentically vibrant. Chinatown’s latest rise to fame isn’t only changing the perception of tourists, either. Some locals who have avoided the area like the plague for decades are now returning. With curious eyes, they wander down Hotel Street, Bethel Street, Nuuanu Avenue, and Smith Street, marveling at the way the neighborhood has changed since they were young. Yes, things are changing in Chinatown. And while it’s truly a group effort between merchants, residents, and business owners, I’d be remiss if I didn’t say that the wealth of new restaurants and chefs weren’t at the front of the charge, knives out, ready to slice into a new chapter for Chinatown. And from the bottom of my eternally hungry stomach, I’m grateful.